SERMONS THAT WORK FROM LUKE 3 is a sermon about listening to the voice of God. Listening to the Voice of God is an expository sermon from Luke 3:1-20. 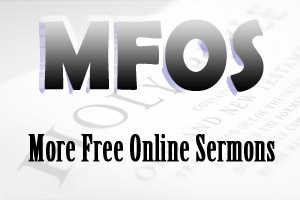 Sermons That Work From Luke is an expository sermon that deals with the topic of Listening to the Voice of God. Let's face it. We live in a world of competing voices. Voices that are constantly shouting at us; telling us how to live, what to buy, how to spend our money, how to spend out time, etc. etc. Who are we going to listen to? INTRODUCTION: As someone said, “We live in a world of competing voices. Everyday we are bombarded by various voices from radio, television, videos, DVD’s, books, music, newspapers, internet, billboards, friends, etc. etc. These voices are constantly shouting at us, telling us how to live, what we need to buy, how we should spend our time, who we need to marry, etc. etc. These voices are very real. They are very powerful, and they want you to listen, they want you to do as they say. However, there is one voice that is different from all other voices. Of course, I am referring to the voice of God. God still speaks to us today through His word. But are we listening to God’s voice? Are we willing to listen to God’s word? Is God’s word shaping our lives or are competing voices shaping our lives? She was young. She lived in a great place. She had a fine husband. God had truly blessed her. Furthermore, she knew God’s word. But one day, someone said to her that God’s word could not be trusted. What would she do? Who would she listen to? Competing voices! We live in a world of competing voices. Would she listen to God or would she listen to this other voice? “Has God indeed said, ‘You shall not eat of every tree of the garden?’” the serpent said to Eve. Eve replied, “We may eat the fruit of the trees of the garden; but of the fruit of the tree which is in the midst of the garden, God has said, ‘You shall not eat it, nor shall you touch it lest you die.’” The serpent said to Eve, “You will not surely die. For God knows that in the day you eat of it your eyes will be opened, and you will be like God knowing good and evil.’ Competing voices! We live in a world of competing voices. Who are we going to listen to? Are we going to listen to the voice of God or are we going to listen to those other voices? Are we going to be shaped by the word of God or competing voices? We all face this challenge. Adam and Eve faced this challenge. Abraham and Sarah faced this challenge. Joseph faced this challenge. Zachariah faced this challenge. Mary faced this challenge. We will all face this challenge. Are we going to listen to God’s word or are we going to listen to the competing voices around us? You know, it was no different for those who heard John preach. Look at verses 1 to 3, In the fifteenth year of the reign of Tiberius Caesar, the word of God came to John and he went into all the region around the Jordan preaching it…preaching God’s word…the good news of Jesus Christ. Would they listen to God’s spokeman? Would they listen to the word of God? When John spoke God's word, he spoke about sin, repentance and Jesus Christ. God had been silent for four hundred years, and now the word of God came to John. And what does John speak about? Sin! Why didn’t he speak about the love of God? (that would get the crowd in) Why didn’t he speak about the mercy of God? Why didn’t he speak about the grace of God? Why sin? Why start with sin? You cannot preach the kingdom of God without dealing with the problem of sin; and if sin is not dealt with according to God's word, then we will perish in a lost eternity. John called on the people to turn away from their sins and to turn to God for forgiveness of their sins. Jesus Himself would confirm this later by saying that the kingdom of God is at hand, repent (Mark 1:15). What is repentance? This is not and unusual question because John’s hearers asked the same question. The Greek word for repentance means to turn - to turn from sin to God. Sometimes, we think of repentance as being ashamed or sorry for sin. But that’s not true repentance. Someone can be sorry and ashamed without being repentant. Judas felt remorse for betraying Jesus, but he was not repentant. He did not turn to God (Matt. 27:3-5). We see this change of heart in verses 11 to 14. The indication of a changed heart is generosity. Someone who has genuinely repented is generous. The indication of a changed heart is honesty. Someone who has genuinely repented is honest. The indication of a changed heart is contentment. Someone who has genuinely repented is content. Repentance involves a changed heart toward sin and God. It seems that some people came to John to be baptised only to escape God’s judgment. It seems these people were not genuine when it came to turning from sin to God. Are we willing to listen to God’s word about repentance? Are we willing to allow God’s word to shape our repentance? John made it very clear to his listeners that he was not the One who would deal with their sin problem or bring about genuine repentance in lives. He was only to prepare the way for the One who would bring salvation for all. John explained that he was not the Christ…he was not the One who would bring salvation. In fact, he made it very clear that his baptism was outward and physical (in that sense, it was only to prepare the people for Christ’s baptism). And Christ’s baptism would be inward and spiritual. In other words, Jesus Christ is the only One who can save us from our sins and bring us into the kingdom of God. Are we willing to listen to God’s word about the Saviour? Are we willing to allow God’s word to shape our thinking about Jesus Christ? The choice is yours. Will you listen to God’s word and turn to Jesus Christ in repentance and faith?